NRK Recycling organized the Plastics Gone Circular Congress 13 June 2016 at Pakhuis de Zwijger– a special occasion gathering people representing institutions, non-profit organisations and companies to show their actions and objectives in the field of plastic recycling. With a full program stretching from lunch until dinner, different presenters came on stage to present their point of view and what they’re doing to reduce plastic waste, as well as covering general considerations, aspects and possibilities of the circular economy in Europe. This was a great opportunity for CITIES Foundation’s director Francesca Miazzo to present WASTED, discussing the project’s achievements, challenges and vision going forward in the context of diverse international actors. Littering must be stopped, add value to waste. Knowing that climate change is a function of industry and transportation, they are the two sectors where most work is needed. Waste is obviously closely related to these two sectors. Europe’s plastic consumption is 60 million tonnes, of which 39.6% goes for packaging and 20.3% for the building and construction sector – the two main fields consuming plastic. Plastic waste in Europe amounts to 26 million tonnes (63% from packaging). In the last 50 years, plastic production grew 8.7% each year. On average, in the EU capitals, only 19% of the plastic waste is recycled. At present, we have a linear plastic economy (make-take-waste) with outdated landfill systems. Plastic is treated as a cheap, disposable material, which shows in municipal waste full of plastic. When plastic is incinerated, all the energy used to produce it is lost forever. Instead, we could reuse the plastic, regenerating its energy for new use. We have to switch our energy behavior. Unfortunately, today all plastic collected to be recycled is counted as recycled, when in fact part of it is never actually recycled. Eight million tonnes of plastic goes to the oceans each year. If we continue this way, in 2030 there will be 1 tonne of plastic for every 3 tonnes of fish, and 1 tonne of plastic for 1 tonne of fish in 2050. Product policy is the trigger for improvement, not waste policy: this means that we have to care about plastic at the time of production, not when it becomes waste. The producer responsibility should not be neglected: The EU directive to come is planning on setting financial incentives to foster plastic reduction and recycling among producers. Traceability is important because when you want to recycle plastic, you have to know which kind of plastic you have. Today, mass production of electricity with solar panels has become cheaper than oil (power plants). In 2025, the plastic recycling industry could create 80.000 direct jobs, and 120.000 indirect jobs. It is important to involve different types of actors. 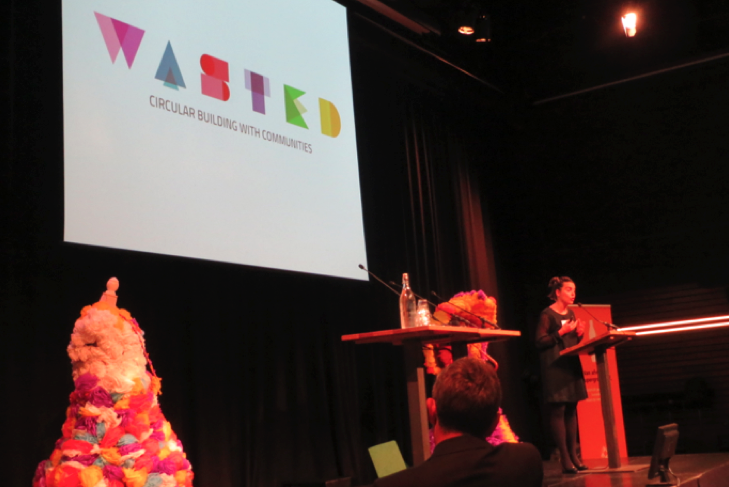 With WASTED, community is the heart of the project, working together with citizens, businesses, organizations and the municipality. They convert waste into feedstock; 35% of the company profit comes from its reconditioning activity. Hybrid plastic used in rail transit – used in Sweden, for example, to allow noise reduction. More information about the event (in Dutch) and the different presentations can be found at http://www.nrkrecycling.nl/congreskunststofrecycling. 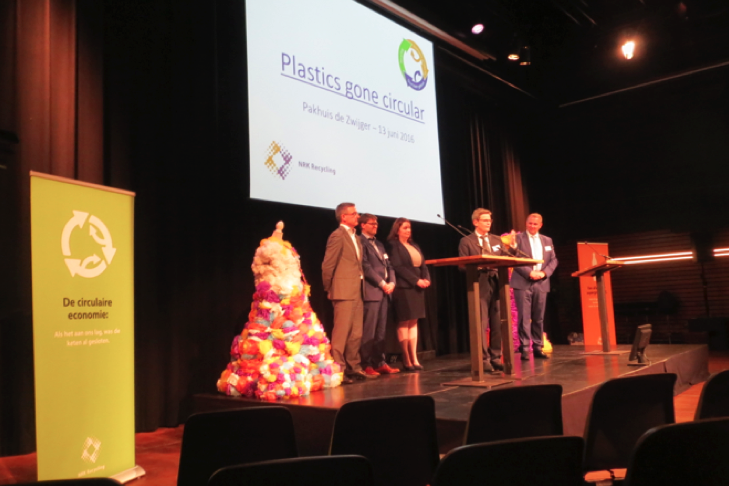 NRK Recycling organized the Plastics Gone Circular Congress to bring together actors from citizens to members of parliament in a push to close the plastic loop, making plastic the standard in sustainable raw materials.